Recently, this omen appeared while I was driving my old jeep down an even older road. "This sign"
suddenly jumped out of nowhere. The optical abruptness made me shift mental gears and I instantly came to the often postponed moral conclusion that most of my life is now resting in 40 or 50 places just like the one this ominous sign pointed out to me. All at once, I was feeling responsible for my garbage plus many "leftovers"
" to the trash can I hear the parental voice telling me to "pick up my junk." This has brought to mind that my numerous droppings and drippings in life are really my responsibility and deserve my full efforts getting them to the city dump specifically and assisting my neighborhood looks in general. A recent Blaine Downtown Business Charette is guiding the consensus of optimistic growth patterns, soon adding many more human super dooper pooper scoopers to our total waste water and garbage operations. 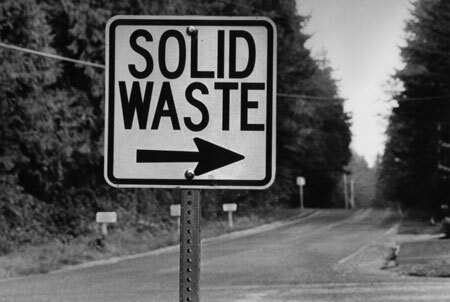 We as a city are indeed growing so, let's each of us review our own personal habits and excesses to develop a "solidified" community waste philosophy.